John Banks: ...so now what? I think it fair to say that when asked to respond in an interview, I like to give a full answer. There's many a time, during the recording of a Big Finish interview for example, when the batteries have expired on the portable gizmo being used to capture my every thought; or when the interviewer, usually Mr David Richardson, has nodded off, having asked something complicated like "so who are you and what are you playing in this story?". 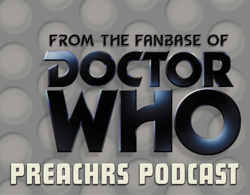 At some time in the not too distant future, it may be that an interview conducted this morning with Benjamin Maio Mackay for The Preachrs Podcast, will be released to an unsuspecting tranche of Dr Who fans, whose eardrums, if not life expectancy, will be severely compromised by the responses I've given to a series of seemingly straightforward and innocuous questions. I've listened to other people being interviewed by Benjamin; Dan Starkey, Sophie Aldred and Nev Fountain for example, whose answers and observations have been succinct, apposite, witty, charming, informative ...and succinct! Not only did I ramble on for ages, I'm now also wondering if anything I said might be actionable in a court of law. "Q: do you like baked beans? A: yes/no", not " let me tell you about the history of the baked bean since it gained popularity in early Sumerian culture...". He'll have to cut it, he'll have to cut it; no server in the world could cope with the pressure of downloading such an interview... and why did I start talking about Tom Cruise? Why? As if that weren't enough, I've just joined the Tweetersphere. Does that make me one of the Tweeterati or the Tweeterscenti or just a bit of a Tweet?